Posted on August 30, 2018 by treelawyer	tagged. Tree law fans (and we consider ourselves to be fans) waited for a long time for the Colorado Supreme Court to decide Love v. Klosky, and do away with the clunky old Rhodig v. Keck rule. The Rhodig rule holds that a tree that has grown up to be a boundary line tree is not owned by both property owners unless the neighbors claiming part ownership can jump through hoops to prove they (or their predecessors-in-interest) helped plant or nurture the tree, or treated it as the boundary line. The Court acted last spring, and we duly reported on the matter at the time. We were quite disappointed by the missed opportunity the Love decision turned out to be, and we said so. Today, we’re reviewing the ruling, because for the next week or so, we will be talking about the strangeness that is the boundary-tree rule. Brushing up on current events, weirdly enough, is a good place to start. In the rest of the civilized world (sorry, Minnesota, not you), a tree that straddles a boundary line is owned by both property owners, usually as tenants-in-common but – as we will see next week – sometimes as something more or less. The general rule is that one owner can’t mess with the tree without the other one’s permission. As 1970s television cooking personality Chef Tell would have said, “Very simple, very easy.” No messy litigation, no one keeping tree-feeding logs, garden shop receipts, or detailed journals of joint plantings of years gone by. Just a simple, binary rule: If the tree crosses the property line, both landowners have an interest. If it does not cross the line, only one does. Unfortunately, the Colorado Supreme Court’s love affair with stare decisis – the legal doctrine that holdings of prior cases should govern the outcome of present and future cases – has led it to a tortured defense of Rhodig. Everyone has it wrong, the Court said: Rhodig doesn’t apply to all boundary trees, just trees that started growing on one side of the property line and grew across the line to encroach on the other property. Johnny could have been talking about this decision. We all learned in 7th grade math that a line segment stretches between points A and B and has no thickness. Unless that tiny little sprig of an oak tree in your backyard has the dimensions of, say, Flat Stanley, the odds that it will not start growing on one side of the boundary or the other approach zero. 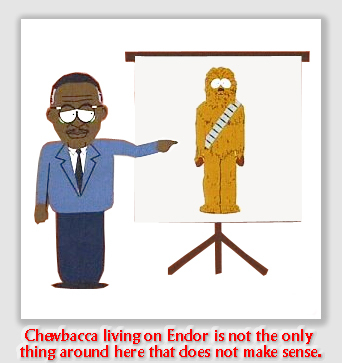 And 10, 20 or 50 years down the road, proving that the tree began its arboreal life straddling a boundary line of no thickness will require legal and arborist legerdemain that will make the Chewbacca defense sound like a Supreme Court argument. 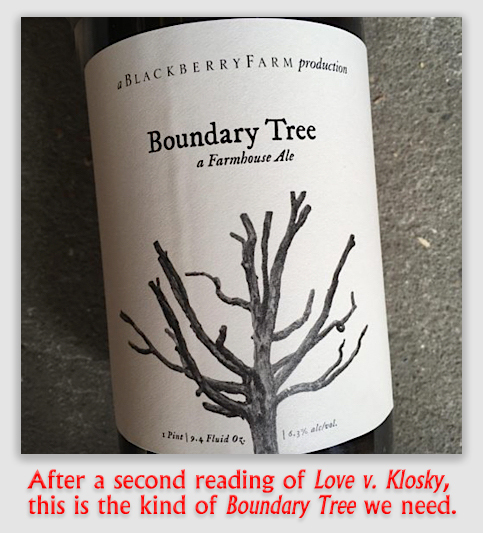 The effect of Love v. Klosky could well be to start a real cottage industry for Colorado lawyers and arborists, proving where young maple or catalpa shoots began their lives. The only trees that are not subject to this nonsensical rule would be those old enough to have been standing in the 19th century when Colorado was first platted. The Colorado Supreme Court had a chance to clean things up by running Rhodig through the tree chipper of legal history. Instead, it labored mightily… and brought forth a mouse. Love v. Klosky, 413 P.3d 1267 (Supreme Court Colo., 2018). 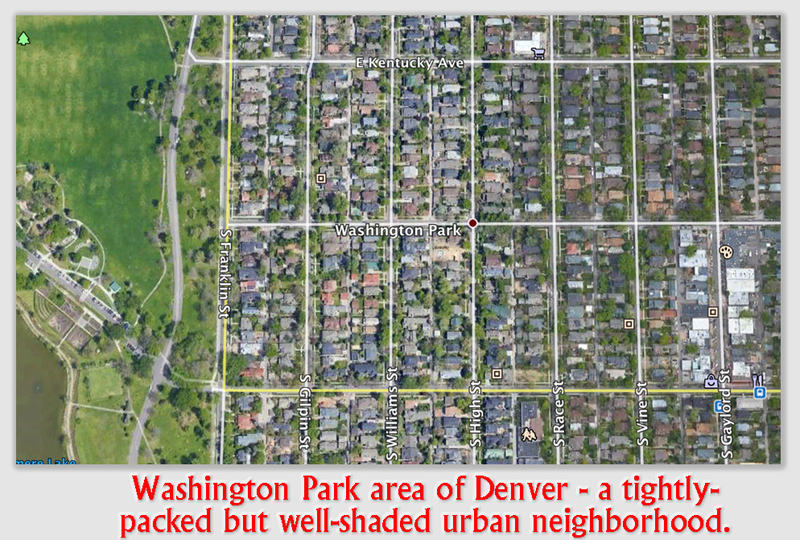 Carole Bishop and Mark Klosky and Shannon and Keith Love own adjacent parcels of land in Denver’s Washington Park neighborhood. A 70–foot tall catalpa tree towers over two adjacent properties. At the base of its trunk, the tree sits roughly three-quarters on the Kloskys’ property and one-quarter on the Loves’ property. The tree began growing on the lots well before the parties moved in, and no one knows who (if anyone) planted it. Whatever its pedigree, the tree sheds leaves, seed pods, and branches on both properties. Unhappy with the debris, the Kloskys want to cut the tree down. The Loves unsuccessfully tried to convince their neighbors not to do so. When persuasion failed, they sued. 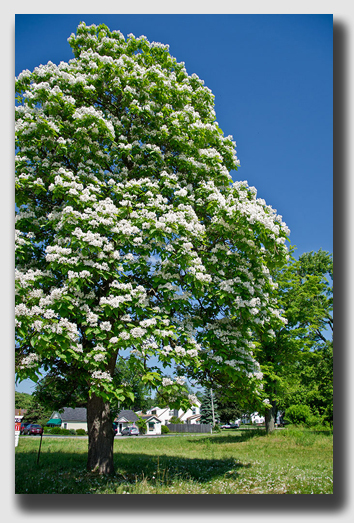 The trial court ruled for the Kloskys, holding consistent with the Colorado rule enunciated in Rhodig v. Keck that unless the Loves could prove that they or their predecessors had helped in planting or maintaining the tree, or that they and the Kloskys’ predecessors had treated the catalpa tree as the boundary, the tree belonged solely to the Kloskeys. On appeal, the Loves argued that Rhodig should be overturned, but the court held it was bound by Rhodig, which it interpreted to mean that “boundary trees are held as common property only if the landowners jointly planted, jointly cared for, or jointly treated the trees as a partition between the properties.” Two of the appellate judges, however, called on the Colorado Supreme Court to overturn Rhodig and require instead that any time a tree straddles two lands, the adjacent property owners jointly own the tree as tenants-in-common. The Loves asked the Colorado Supreme Court to review the case. Held: The Supreme Court, refusing to overturn Rhodig v. Keck, held that the Kloskys could remove the tree because it remained the sole property of the owner of the land where the tree first grew unless the tree was jointly planted, jointly cared for, or treated as a partition between the two properties. Because the Loves could not prove any shared property interest in the tree, the could not prevent the Kloskys from removing it. The Loves argued that Rhodig should be overruled, and that the Court should automatically make them tenants-in-common with the Kloskys for no other reason than the catalpa tree had crossed the property line. The Kloskys on the other hand, argued that Rhodig holds that even when a tree crosses over a boundary line, it remains the property of the owner of the land on which the tree originally grew unless one of the joint-action situations enumerated in Rhodig applies. The Court said there was no sound legal basis for abandoning Rhodig, surmising that “our ambiguous precedent caused the lower courts to conflate the common law rule for true boundary-line cases and the test for encroachment trees.” Instead, it clarified that Rhodig only governs “encroachment trees,” trees that begin life entirely on one property only to migrate partially to another. Under Rhodig, a landowner may remove such a tree without first securing the approval of his neighbor, unless the landowners jointly planted, jointly cared for, or jointly treated the trees as a boundary marker. The Court said that Rhodig does not represent some weird minority rule on boundary trees. Indeed, the Court lectured, the common law rule regarding true boundary-line-tree cases – where the tree sits squarely on a property boundary with no evidence of migration – is not implicated by Rhodig. In such a case, a tree standing on the division line between adjoining landowners is generally considered the common property of both landowners, even in Colorado.